Formulation scientists have become pivotal to pharmaceutical development, in that they are often faced with the daunting challenge of not only identifying the most suitable drug delivery platform among a myriad of options, but also developing and validating robust systems that address the challenges posed by increasingly complex drug candidates, in ever shortening time frames. Among these platforms, lipid-based formulations have become a well-established strategy that has been shown to improve the bioavailability and reduce the food effects or variability of poorly soluble compounds. 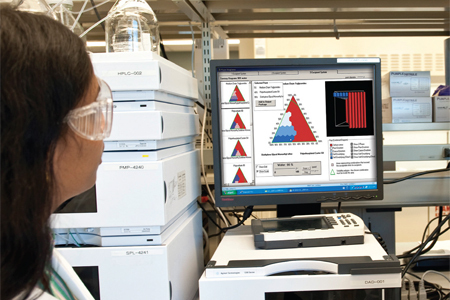 Capsugel has developed a new strategy that moves beyond predictive modeling and excipient high throughput screening, utilizing an expert system based on experimental data that generates phase diagram output packages and provides unique formulation development support as well as increased speed to market. Today, up to 90% of new chemical entities in development are said to fall under either Biopharmaceutics Classification System (BCS) Class II (70%) or Class IV (20%)1. In other words, the bioavailability of the vast majority of drug candidates is expected to be low and/or variable, in a way because of their poor solubility in physiological (aqueous) media. And while most Class IV candidates are sent back to chemistry groups, where efforts concentrate on further optimization, Class II compounds can have their solubility increased through a number of different technology platforms including, but certainly not limited to, pH adjustment, salt formation, particle size reduction, and lipid-based formulation2. Lipid-based formulations, however, are often complex multi-component systems that form a variety of phases upon dispersion in the gastric environment; without an expert system, their development can appear non-viable due to time-consuming and frustrating trial and error formulation.